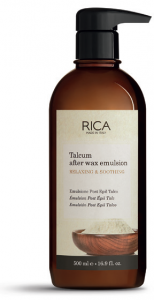 The waxing has to be a wellness experience, RICA strives to promote the waxing ritual. 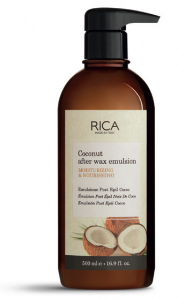 That’s why RICA offers a wide range of products specifically designed for skin treatment pre and after waxing. Menthol extract calms normal redness leaving skin cool and refreshed. Lemon extract promotes rapid recovery of the skin after epilation. Rose extract gently calms and soothes skin. 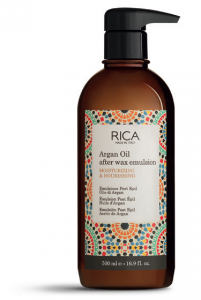 Argan oil is exceptionally moisturing and soothing. 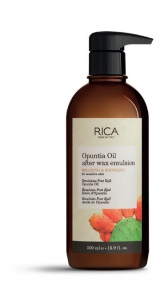 Opuntia Oil Antibacterial, moisturizing anti-inflammatory, cicatrizing action. Is a strong anti-oxidant, moisturizing, nourishing and toning the skin. Concentrated, non-greasy serum to slow hair regrowth. Contains calming Avocado Milk, refreshing Menthol, reviving extract of Papaya and healing Aloe Vera. A calming gel featuring a prickly pear extract with anti-inflammatory properties to keep skin cool and comfortable after hair removal. Coconut Exotic scent for a relaxing atmosphere, Natural oil of coconut for moisturizing. Talcum powder gentle emulsion to remove wax residues and sooth the skin. 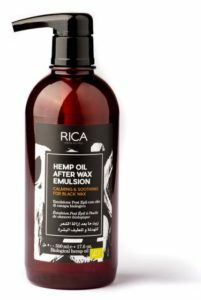 ARGAN OIL for moisturing and soothing the skin after epilation. Opuntia Oil is an exceptionally antibacterial. Moisturizing anti-inflammatory, cicatrizing action. Restore your skin after epilation. Calming and soothing emulsion with a refreshing action.